UPDATE! IGOR has BROKEN HIS FORESTAY at the mast head and is now using halyards to take the load while he works out the best way to repair the damage. Conditions at the moment are 25/30kt Northerly with a 3/4mtr sea. He is 2000 Miles from CAPE TOWN and 2600 Miles from Australia. His plan at this time is to wait for better weather before making any repairs. He has NOT requested any assistance and is VERY CONFIDENT of making a good repair. GGR will monitor the situation and has NOT declared a CODE ORANGE. IGOR has a BIG job ahead of him but he is a very resilient and capable sailor. #GGR2018 GOOD LUCK! UPDATE! 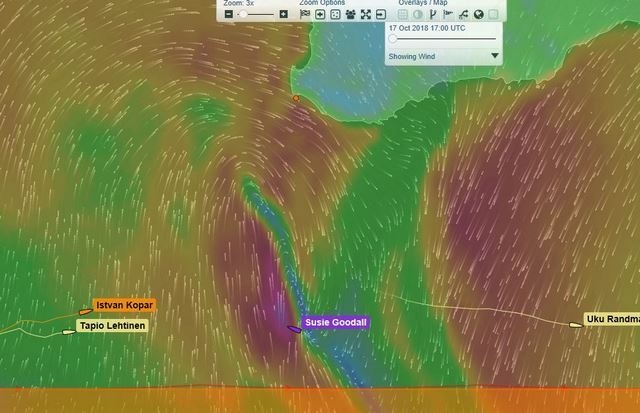 Susie Goodall Racing is at the bottom of the storm cell right now forming next to her. She is in for a tough 12 hrs but is in the SAFE ARC so will not be trapped in the system. 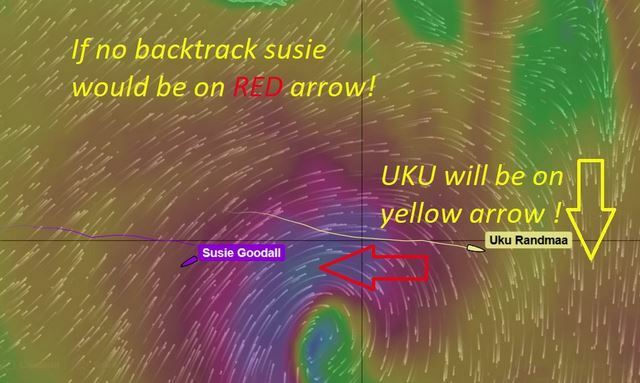 UPDATE: Susie Goodall Racing just confirmed she could see the calm coming in first Picture. This suggests forecasting is correct. Wind will suddenly swing to the south increasing rapidly and Susie will make for North West. She will have 45/50kts from the south but slowly the wind will swing to South West and decrease as the center moves away. She can then follow that around and slowly start making east course again. If she had NOT turned around the storm may have encircled her creating VERY dangerous seas and she would have been held in it longer. Even now there is going to be a bad sea as she currently has a NORTH swell and will have strong South winds in the next hour. BUT she is now in the safe sector to be blown away from the worst. We are all thinking of her. Watch this on the Tracker and think of Susie. her positions are every hour. It is a nasty storm. UKU will outrun it. 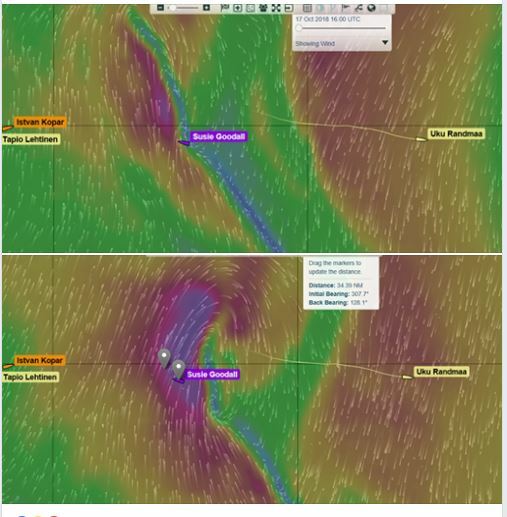 Susie said it was so hard sailing west because of all the ground lost in the Race!...#GGR2018 the date and TIME UTC is on top of each photo. But it's still 5 miles less than Mark Sinclair and Igor Zarestskiy, who sail much more peacefully in a fleet tail in a north stream that pushes them into a manageable sea on the direct road. They should slow down again in two days with training around them from a high pressure zone. In Front, 1600 miles from there, Loic Lepage (Chichester Category) also slips full in a good south wind that will gradually grow to the west. As for tapio lehtinen and istvan the, they are still making a duet in a moderate south flow that will clearly strengthen by passing west in two days, so that the organization also asked them not to go down to stay at It's the biggest of that wind coming. At least they're together, less than 10 miles from each other. 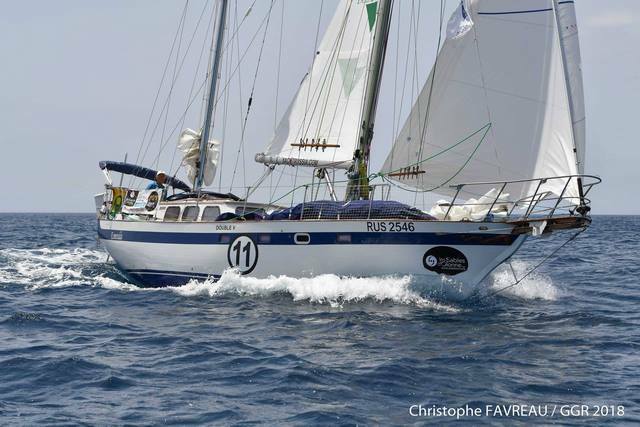 If they talk to the VHF, tapio is having fun saying they're almost within reach! A significant comfort in these hostile and isolated regions of the globe... especially for the Finnish who owns the lowest boat on the water of the fleet.